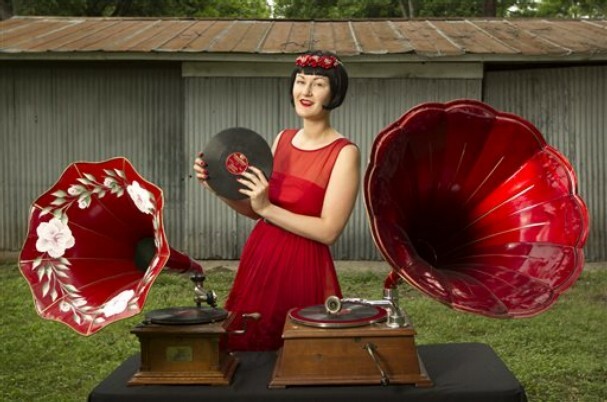 The antique record players are hand-cranked, and date from 1907 to 1927. They do not require electricity, making them perfect for outdoor weddings, cocktail hours, picnics, gallery shows, and in-store promotions. The machines are quite loud, and do not necessarily require amplification, although we can hook them up to microphones if the venue has a PA. The music played ranges from 1920s hot jazz to Classical to Texas Swing. The records are all 78 RPM format, and date from the early 1900s to the mid 1940s. Please contact me via email for information and special rates on in-store appearances, educational demonstrations, or happy hours. Contact me, and we can set a time for you to come over to have a listen to the gramophones and talk about the details of your special day to see if we are a good fit. After we chat about your big day I can send a booking proposal where you can sign the contract and pay the deposit online. I arrive to your event with cases of records, the two red horned gramophones, a black table linen, and a 6 foot folding table. Rates begin at $350 for setup and the first hour of performance, each additional hour is $100. Also, I have a large network of professional musicians that I partner with, so if you wish to have swing, big band, or vaudeville hot jazz at your event, do let me know.